With a mid-high slope of 126 spread across a generous 160 acres, Red Lodge Mountain Golf Course has enough challenging terrain to keep you on your toes. Add to that several lakes, lots of creek crossings, the occasional July snowstorm, and a neighborhood moose or deer wandering across your fairway, and a day out on the Red Lodge links never feels like the same old thing. The course opens to the public soon after the spring snow melts, usually mid-May, and the season runs through Mid-October. Call ahead or just come up to the clubhouse–impromptu tee times rarely require a wait. 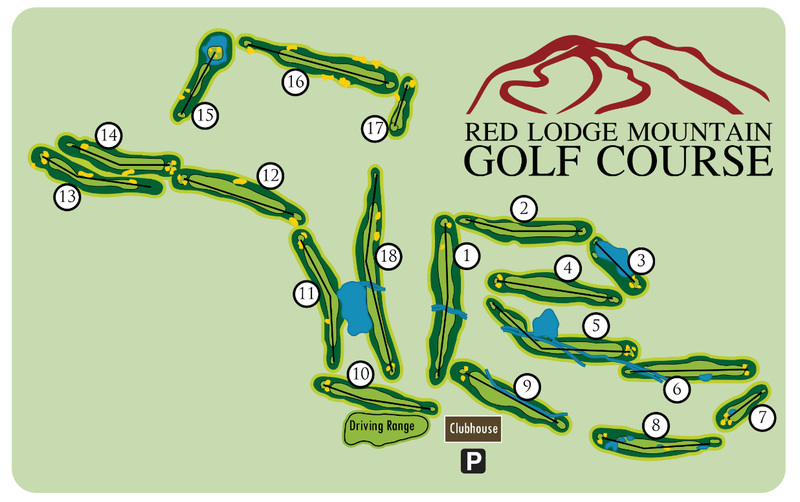 Red Lodge Mountain Golf Course hosts several tournaments and special events throughout the year. To get involved, check out our calendar or “like” us on Facebook. Expect the unexpected on this beautiful and challenging course. Lots of creeks, lakes, hills, and our “signature” island green on the back 9 make the Red Lodge Mountain Golf Course an experience you’ll long remember. Trees and water hazards challenge you right from the start as you head out on Hole #1. Next, you’ve got two par 3 holes with substantial lakes that separate the tee from the green. Holes #4 through #9 play alongside two streams, crossing them continually. The back nine begins with a promising birdie opportunity on Hole #10, but Hole #11 has several water hazards and a well-bunkered green. Holes #12, #13 & #14 are Scottish-style holes with tall grass in the rough and wide, long fairways. Holes #15 through #18 start by dropping 80 feet off the bench down into the Rock Creek valley. Hole #15 is everybody’s favorite, a unique and fun-to-play “island green”. A long par 5 plays deceptively uphill along the valley floor. Stopping halfway back up the bench is a short par 3, while Hole #18 finishes on top of the bench playing back toward the clubhouse.